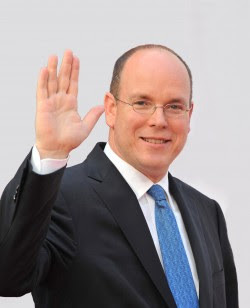 „His Majesty Albert II, the King of Monaco, launched his first official visit to Mongolia on Friday at the invitation of the country's President Nambaryn Enkhbayar.“ That is how the Mongolian State News Agency Montsame announced the arrival of Prince Albert of Monaco in Ulaanbaatar last Friday. No doubt a welcome upgrading for Prince Albert, who has been extremely active diplomatically, with within the last two years official and semi-official visits to the Asian giants China and Japan, to Thailand and Russia, and now Mongolia. Albert arrived from Beijing, where he attended the Olympic Games. The prince is member of the International Olympic Committee. President Enkhbayar, who earlier in the week welcomed Crown Prince Frederik of Denmark, held talks with Albert in Government House. Later Friday the prince also met with the Speaker of Parliament and the Mongolian Prime Minister. Albert said he was happy with his warm welcome and added that his country would cooperate with Mongolia in environmental matters. „The Albert II Foundation is ready to help Mongolia with cooperation against desertification and disafforestation. A project of Monegasque and Mongolian joint archeological research is being implemented since 2006. I took this project under my auspices in 2007“. In addition, the ‘King’ congratulated the Mongolian athletes with their success at Beijing-2008 Olympic Games. Albert also visited the museum of the Archeological Institute at the Sciences Academy. 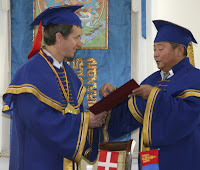 There he was awarded with an honorary doctor title of the Academy, just as Crown Prince Frederik of Denmark received a honorary degree one day earlier from the Mongolian State University for Education. 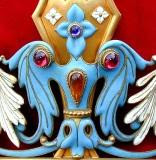 Diplomatic relations between Monaco and Mongolia were only established May 22, 2008. The Monegasque government selected Mongolia in 2008 as the partner country in Asia for its development cooperation and presented a non-refundable aid for USD 20.000 for an archeological project the Prince visited on Saturday. On the second and last day of his official visit to Mongolia, Prince Albert visited Arkhangai aimag (province). He toured historic and cultural places and acquainted himself with the nomadic life style. In Arkhangai the prince went to see the Museums of Ethnography and History. A Mongolian-Monacan joint archeological research project is carried out on the boundary of the aimag Battsengel and Ikhtamir soums. Albert witnessed some activities of the experts who are studying the Deer Stones of the Turkish period in the Tsatsin denj area, the Mongolian State News Agency reported. Albert visited the „Taikhar chuluu“ tourist camp and watched a mini festival of three manly sports games. In Ikhtamir soum, the prince visited a herding family, just as Danish Crown Prince Frederik had done a few days earlier. The Mongolian State University of Education has a new Honorary Doctor: Crown Prince Frederik of Denmark. The University’s rector B.Jadamba said the award was in recognition of Denmark’s significant support to Mongolia's educational sector. The honour bestowed was meant for Denmark as a whole, and not as a reward for outstanding academic endeavours by the Crown Prince. Nevertheless Frederik in his acceptance speech stressed his willingness to intensify more a cooperation between the two countries in education and culture. Various Danish non-governmental organisations are involveld in programmes and projects to support Mongolia’s educational sector and to improve the education of marginal and vulnarable groups in Mongolia’ society, the State News Agency reported. 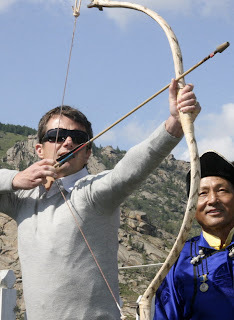 Frederik earlier in the day showed his prowess in the ancient Mongolian sport of archery. It was a nice chance for the 40-year old heir to the Danish throne to take part in sport, after ten days of being a spectator at the Beijing Olympics in neighbouring China. On the last leg of his three day official visit to Mongolia Crown Prince Frederik of Denmark went to the Press Institute in the capital Ulaanbaatar. The Institute was founded in 1996 with financial help from the „Press and Information Monitoring“ project, and carried out by the Danida international aid organization of Denmark. The Institute runs activities to develop independent journalism in Mongolia and provides media people with knowledge about contemporary journalism and arranges training sessions. The Mongolians thanked Denmark for its invaluable help in getting a free press off the ground in their impoverished and former communist rules country. Frederik in turn said to be satisfied with the success of the project and he congratulated the Press Institute's administrative council for making a valuable contribution to developing free journalism in Mongolia. The official visit coincides with the 40th anniversary of Mongolian-Danish diplomatic relations. The Prince met with the President of Mongolia, Nambaryn Enkhbayar and Prime Minister Sanjaagiin Bayar. 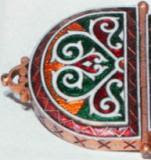 Præsumably, the Mongol culture has not developed the Occidental distinction of a “sovereign prince”, as distinct from a “king”, and neither is it familiar with the style “His Serene Highness”; I imagine that to them, a “prince” is always an heir, and never a monarch in his own right. Did they refer to HRH Crown Prince Frederick by their æquivalent of “(crown) prince”?